As the Scoutmaster of San Leandro Troop 503, I want to personally welcome you and your family to our Scout Troop and the Boy Scouts of America. 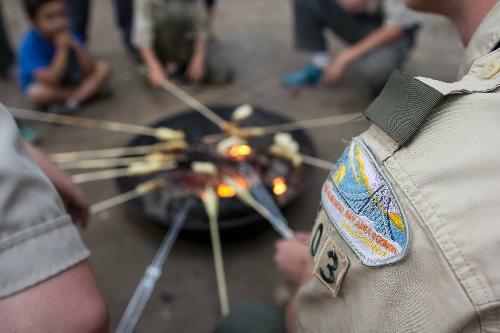 Troop 503 has a long history in Scouting that dates back over ninety years to our founding in the 1920’s. Our mission is to prepare young men for roles of leadership, for adventure and exploration, and to make ethical and moral choices over their lifetimes by instilling in them the values of the Scout Oath and Scout Law. We pride ourselves on being a Troop that is open to all Scouts regardless of their abilities or disabilities. Our members help one another reach their own potential growth through the Patrol Method. Patrols are the building blocks of our Boy Scout troop. The patrol is a small group of boys who are similar in age, development, and interests. Each patrol working together as a team shares in the responsibility for the patrol's success. Troop 503 is a boy run Troop and as adult leaders we act as guidance counselors to the boy leaders. The Scouts plan their yearly activities and we help them carry out those plans. I hope that you will find our Troop as exciting and rewarding as the other Scouts do. Each week I address the 4 pillars of Troop 503. Adventure, Service, Advancement and Leadership. From there it is the Scouts themselves that run and organize our meetings. It's not always the polished meetings of adults but these Scouts do a great job. You can't learn without doing. You won't always succeed but you will always learn. Leadership is no exception. Once again welcome to Troop 503. Meeting Location: 951 MacArthur Blvd, San Leandro, corner of MacArthur Blvd & Dutton Ave.